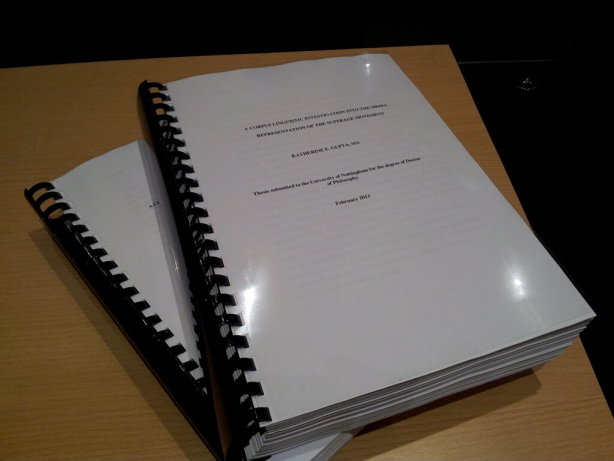 So, yesterday I submitted my thesis. My supervisor told me to take a good break before we meet to start preparing for my viva, so genuinely not sure what to do with myself now that the ever-present feeling that I ought to be doing some work has lifted! Annoyingly I had to submit the thesis using my legal name as that’s what’s on the university’s records. I never use that name and if you try calling me that, I probably won’t respond as I’ll assume you’re talking to someone else. Tagged being a PhD researcher, thesis.